LEXINGTON, Ky.--(BUSINESS WIRE)--SafeCare Magazine announced today that Joe Kiani, Founder of the Patient Safety Movement Foundation and CEO of Masimo, was awarded Person of the Year for 2015. This award recognizes and applauds the one individual who contributed significantly towards improving patient safety and healthcare quality across the globe. The 64 nominees and finalists included Dr. Victor Dzau, President, Institute of Medicine of the National Academy of Sciences, Dr. James Bagian, former astronaut, Director, Center for Healthcare Engineering, University of Michigan, Dr. Atul Gawande, Surgeon and public health researcher, Dr. Peter Pronovost, SVP for Patient Safety and Quality, Johns Hopkins University of Medicine, Dr. Mark Chassin, President of the Joint Commission, Dr. Ala Alwan, World Health Organization, Dr. Patrick Conway, Chief Medical Officer for Medicare, Dr. Cynthia Deyling, Chief Quality Officer, Cleveland Clinic Health Systems, Dr. David Bates, Chief Innovation Officer, Brigham and Women’s Hospital, Dr. Robert M. Wachter, Professor and Interim Chairman, Department of Medicine at University of California San Francisco, and Dr. Hardeep Singh, Chief, Health Policy, Quality and Informatics Program, Houston Veteran Affairs Health Services Research Center for Innovation. SafeCare Magazine’s mission is to deliver information on the people, ideas, organizations and novel technologies affecting safe, efficient and quality healthcare to the sector’s most influential leaders. The publication’s 100 SafeCare Hospital ranking is firmly rooted in the evidence-based framework of the Affordable Care Act, evaluating hospitals in HVBP, HRRP, and HACRP metrics. For more information, please visit www.safecaremagazine.com. 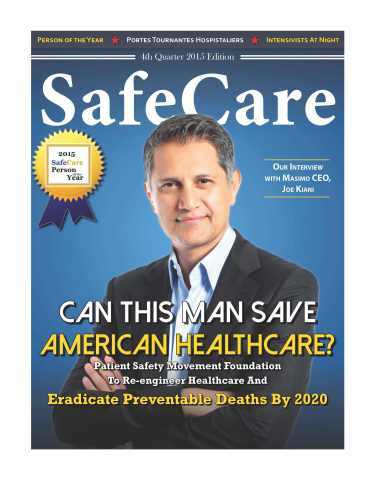 SafeCare Magazine announced today that Joe Kiani, Founder of the Patient Safety Movement Foundation and CEO of Masimo, was awarded Person of the Year for 2015.